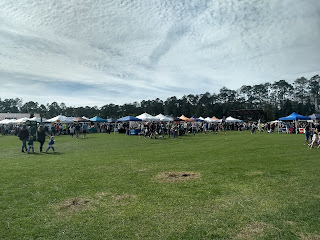 We spent our first day in the Nocatee area of St. Johns / Duval in order to check out the farmers market. While there were only three actual farmers at the market (two produce and one dairy), it was still interesting to see the planned community. In fact, our kids were quick to suggest their grandparents look into the area, since it has a certain feel that's similar to some of the retiree planned communities in Florida but without the stigma of being just for old fogies. But what about those fees and cost of getting in? It's really hard to find the CDD or CCD fees for Nocatee if you don't know which resources to use. No one wants to be nailed down to a certain amount, and the official link that one realtor has to the Nocatee website has been removed. I think the reason is that people can get different deals on this fee (but not the HOA), and there are different sections to Nocatee (some are even gated). I found one realtor who said the area he was selling had $1,800 CDD fees per year and $300 HOA fees. I saw some on Zillow that claimed $30 a month or $360 a year for HOA (probably different neighborhood). That's a 40' wide lot, so not a mansion, I assume. Another house I saw had a $41 per month fee, or round $500 a year. Actually, even if they're not mansions, the going rate in Nocatee seems to be around $200 a square foot, or nearly double what a lot of the houses here in Jacksonville get. Then taxes, CDD, and HOA. So it's not cheap to buy in, but you can find the prices ahead of time if you want to know. The HOA fees are generally listed along with the house listing, so on Zillow (my go-to site), just look for HOA fees, but you'll have to click on "More Facts and Features." The way to find the CDD fees is easy enough on properties that have already paid taxes, as in not brand-new. On Zillow, at the bottom of the More Facts and Features area, you'll be able to go to the County Website. There, you can see the county numbers on the property. 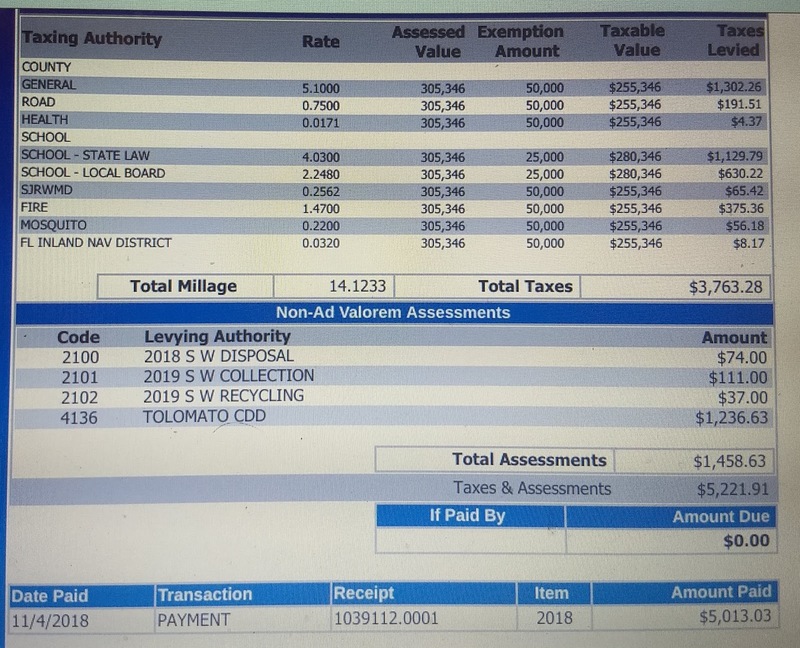 Click on My Tax Bill to see the various parts of the bill, including a separate line for CDD. Since the CDD is part of your taxes and your HOA can evict if you don't pay, be prepared to pay these amounts. While it's possible CDDs disappear over time, it's also possible that the community will need more infrastructure. Also, don't just use last year's tax bill. I have seen some oddly-priced bills that seem to include some deferred taxes or assessed values that are way off. I assume this has to do with the builder still owning those homes (or fraud), but the point is that your home won't qualify for all kinds of reductions once you buy it. For us to buy a house similar to the one we have, let's say 2,000 square feet, it would cost about $400,000 for the home in Nocatee. Then you'd have to figure in the taxes, CDD, and HOA, so probably another $5,000 per year. 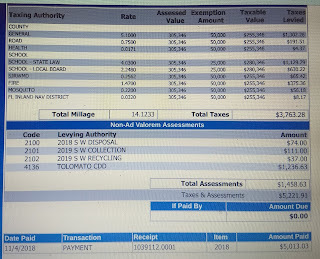 From the homes I looked at, it seems there's a range of HOA fees and CDD charges. Annually, $1,200 to $1,800 in CDD and $300 to $500 for HOA (in homes I looked at). Remember, your tax bill will also be higher if you don't take your homestead exemption. For perspective, my Milwaukee house is only worth about $200,000 and has taxes alone of $4,200, so it's not like the cost of living in Nocatee is really much higher than some places in the country. I've met a lot of people around here who have relocated from the New York, Pennsylvania, and other East Coast locations, and I assume the taxes there are probably more in line with Wisconsin, but the house prices are probably higher, so many people will be getting a lower tax bill even if a CDD and HOA are included. 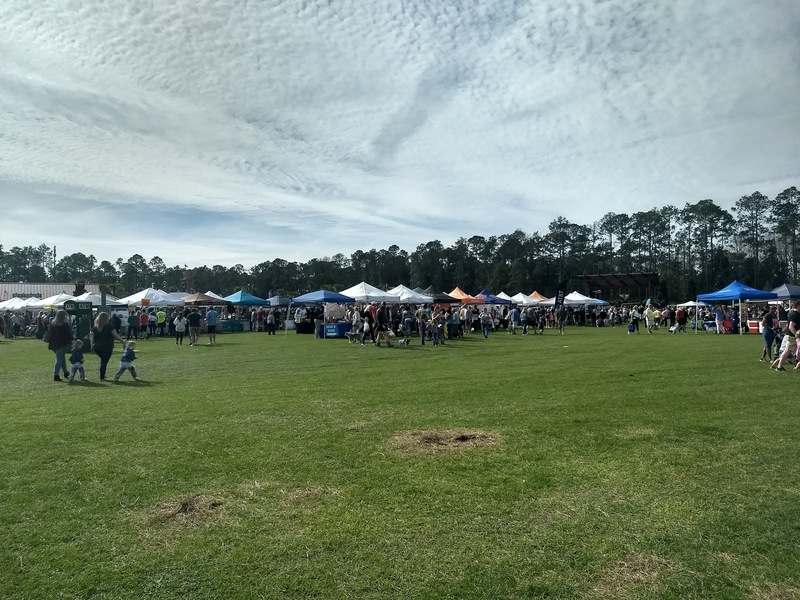 You'll get good schools and whatnot, but you'll also have to drive to get to anything else, including your job, since there are no white collar jobs in Nocatee. Actually, the main argument against vast, planned suburbia is probably that work isn't planned into the equation, with service workers (who can't afford to live there) and teachers (who also can't afford to live there) as the only people who have jobs in the community. Until someone builds a hospital, at least.